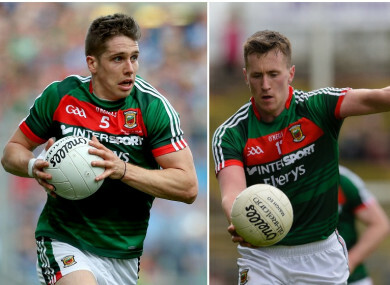 Bad news for Mayo's Lee Keegan, better news for Cillian O'Connor. MAYO FOOTBALL FANS woke up this morning to the news that Lee Keegan will miss their team’s Connacht senior football quarter-final against Galway on Sunday 13 May. The 2016 Footballer of the Year, who dislocated his left shoulder during Mayo’s league defeat to Tyrone last Sunday, is expected to be out of action for at least two months. Keegan sustained the injury after being hit by Tyrone midfielder, Padraig McNulty, who was shown a straight red card by referee Maurice Deegan for the heavy challenge. An MRI scan earlier this week confirmed the full extent of the damage. However, the news is much more positive on Mayo captain Cillian O’Connor. The 25-year-old tore his hamstring in the early stages of last Sunday’s game but the indications are that he is expected to have recovered in time for the 13 May clash. sidelined for approximately six weeks. Mayo manager Stephen Rochford will badly miss both Keegan and O’Connor for next Sunday’s league relegation battle against Donegal in Ballybofey. He will also be without All-Star defender Brendan Harrison and experienced utility player Donie Vaughan, who are still working their way back to match fitness. But All-Star Chris Barrett, who hasn’t played for Mayo since last year’s All-Ireland final, may be involved against Donegal after lining out for his club last weekend. Mayo supporters will also be relieved to hear that 2017 Footballer of Year, Andy Moran, is not expected to face any further disciplinary action after being shown a black card during Mayo’s loss to Tyrone. Moran was dismissed for remonstrating with referee, Maurice Deegan, after a decision had gone against him. Email “Keegan to miss Mayo's Connacht opener but hope that O'Connor will be back for Galway game”. Feedback on “Keegan to miss Mayo's Connacht opener but hope that O'Connor will be back for Galway game”.